Preheat the oven to 250°F/120°C. Line a baking sheet with parchment. 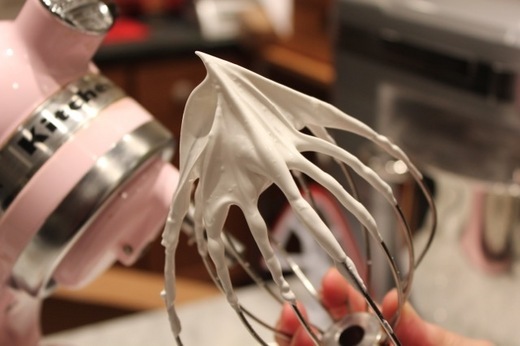 In the bowl of a stand mixer, add the chickpea liquid and sugar and use the whisk beater by hand to stir it together. Attach the whisk beater. Starting on low speed, and gradually increasing to high, beat for 15 minutes until fairly stiff peaks form when the beater is raised. They will droop slightly. 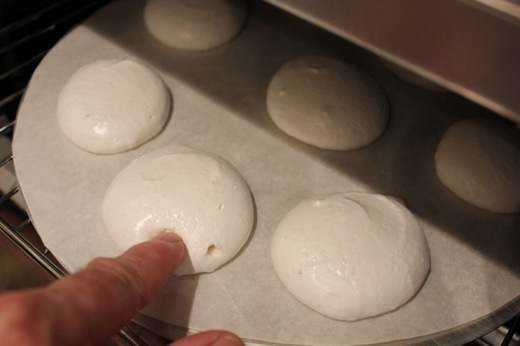 Place a dab of meringue underneath the parchment in the center to keep it stationary. 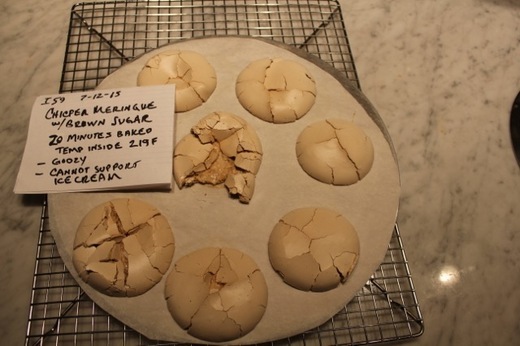 Use two large tablespoons or pipe mounds onto the parchment. Bake 40 to 50 minutes. 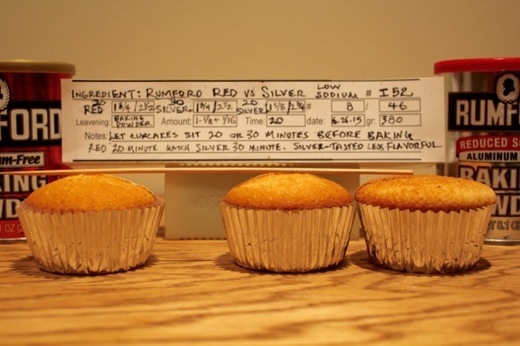 At 50 minutes, Woody pressed one and it was not yet crisp so we continue baking another 10 minutes. 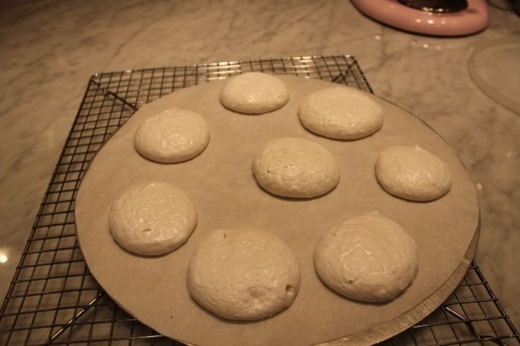 This caused the meringue to begin to brown and become less smooth but still not crisp, however, after removal from the oven and cooled they became perfectly crisp. (We should have taken them out at 50 minutes.) Thus encouraged we decided to try our praline meringue ice cream sandwich cookie recipe which uses brown sugar. The mixture did not form stiff peaks but tasted absolutely delicious. 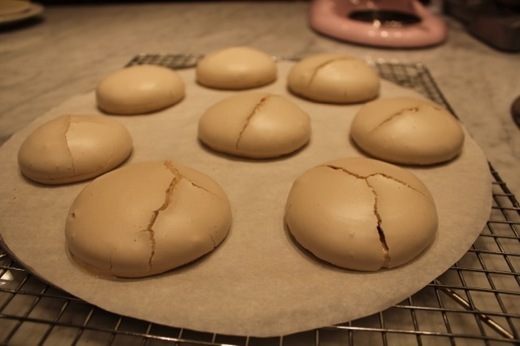 The meringues cracked during baking, which they normally do, but looked puffy and promising. Sadly, on cooling, they deflated and the centers were gooey liquid even on further baking. 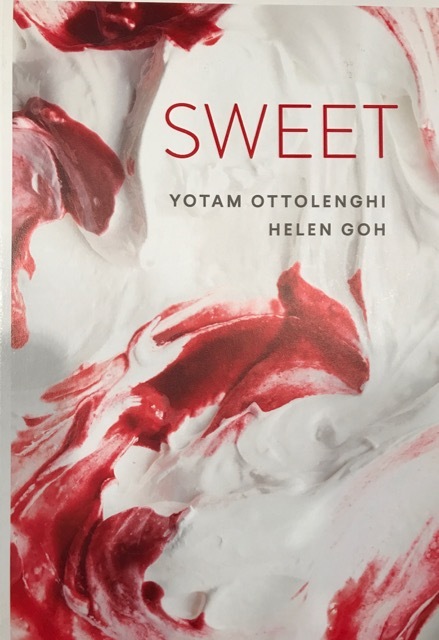 We are not vegans but if we were, we would find that the meringues made with aquafaba and superfine sugar, which are delicate and light, are a perfectly acceptable substitute for the egg white variety. The long cherished tradition of handing the beaters and bowl to the kids to lick is once again reestablished thanks to the availability of Safest Choice™ pasteurized eggs for the consumer. 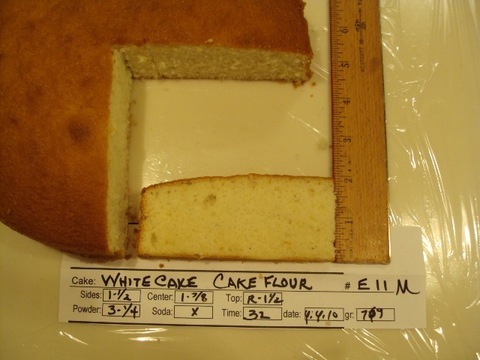 As a result of the experimentation we performed, featured in previous postings of "The Power of Flour," we found that we preferred potato starch to cornstarch when converting bleached all-purpose flour to simulate cake flour. Woody and I were then curious to see what would happen if we substituted equal weight potato starch for the cornstarch component in a classic génoise. 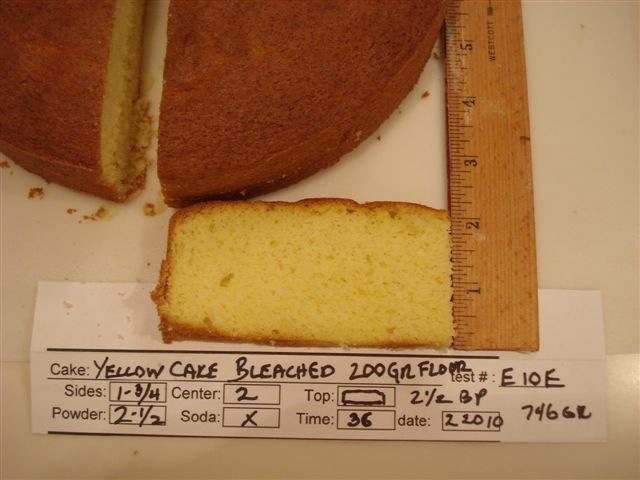 The purpose of all these tests for Part 1 and Part 2 of "The Power of Flour" was to determine the optimum level of baking powder when using my two-stage method of mixing cakes to be baked in 9 by 2 inch high pans.The 'control' cake for Part 1 was the "Downy All-Occasion Yellow Cake" from the Cake Bible which uses cake flour and all egg yolks, adapted from (2) 1-1/2 inch high pans to (1) 2 inch high pan. The goal in Part 1 was to achieve the best texture and flavor if using bleached or unbleached all-purpose flour instead of cake flour. 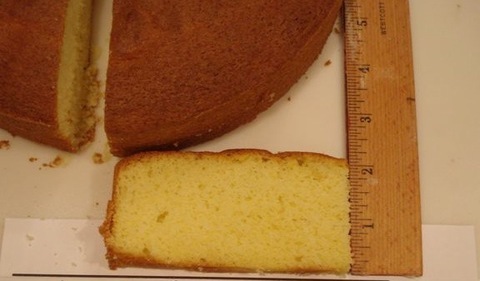 In order to adjust for a higher 2-inch pan, we used 2/3 the batter that would be used for (2) 1-1/2 inch high pans and we decreased the baking powder from what would have been 2-5/8 teaspoons for 2/3 the batter to 2-1/2 teaspoons as higher pans need a stronger structure. 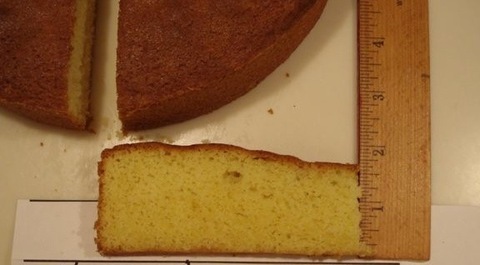 The goal in this Part 2 was to achieve a level cake layer for use as a two-layer cake, if replacing the egg yolks with either all egg whites or whole eggs. 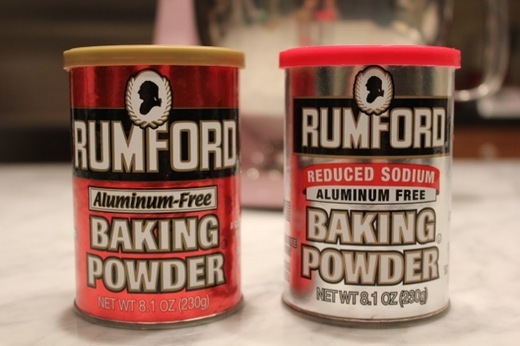 In order to accomplish this goal we needed to see what adjustments of baking powder--if any--are necessary when replacing the egg yolks with either egg whites or whole eggs. Note: All Ingredients except for the baking powder and salt were weighed. (Eggs, and the yolks in proportion to the whites, vary widely from egg to egg so weighing is necessary for trust-worthy, consistent results.) 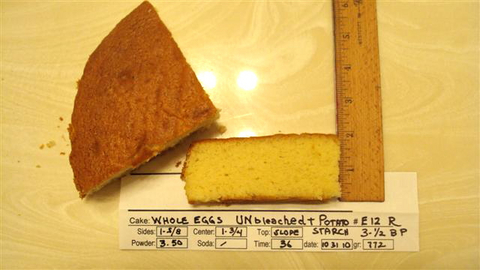 Type of Flour: Cake Replacing the 4 egg yolks with 3 egg whites: baking powder increased from 2-1/2 teaspoons to 3-1/4 teaspoons. Replacing the 4 egg yolks with 2 whole eggs: baking powder increased from 2-1/2 teaspoons to 3-1/2 teaspoons. Type of Flour: Bleached All-purpose Replacing the 4 egg yolks with 3 egg whites: baking powder increased from 2-1/2 teaspoons to 3 teaspoons. Replacing the 4 egg yolks with 2 whole eggs: baking powder increased from 2-1/2 teaspoons to 3-1/4 teaspoons. Type of Flour: Unbleached All-purpose Replacing the 4 egg yolks with 3 egg whites: baking powder increased from 2-1/2 teaspoons to 2-5/8 teaspoons. Replacing the 4 egg yolks with 2 whole eggs: baking powder increased from 2-1/2 teaspoons to 3-1/2 teaspoons. Notes: We were surprised to find that though using all egg whites makes the structure stronger, using whole eggs makes it stronger still. These results are predicated on weight of the major ingredients. 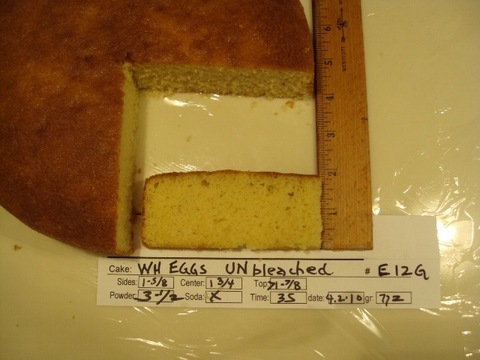 If using volume for the eggs, be sure to measure them as the proportion of yolk to white varies from egg to egg. If using egg whites that have been frozen, be sure to stir the thawed whites well with a fork to combine evenly. 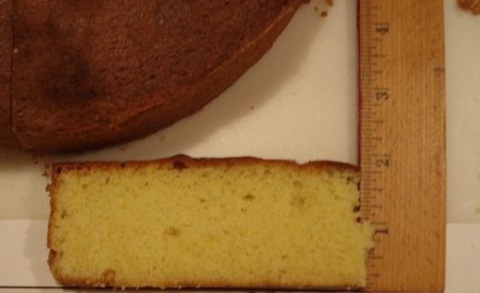 A 2-inch high pan makes a very nice single layer cake. 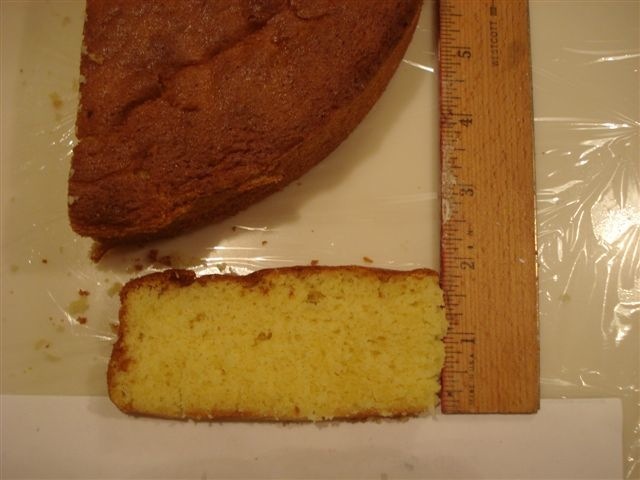 If making just one layer you may want to decrease the baking powder by 1/4 teaspoon to give it a slight dome. 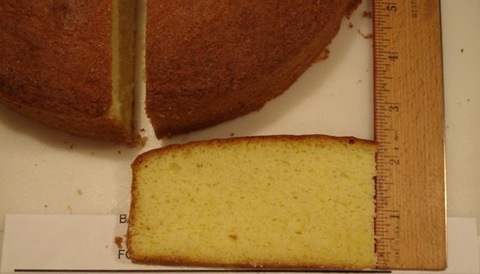 If making a two layer cake everything should just be doubled. 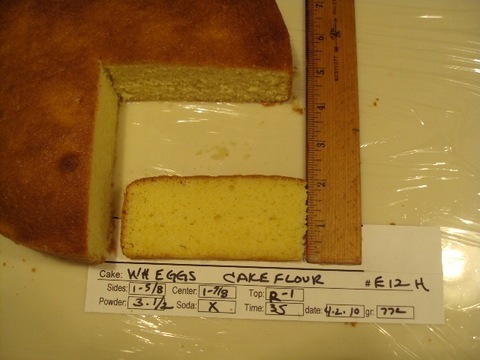 Final Conclusions for Part 1 and Part 2: Egg yolks give cake a fuller flavor, egg whites give cake a softer texture. 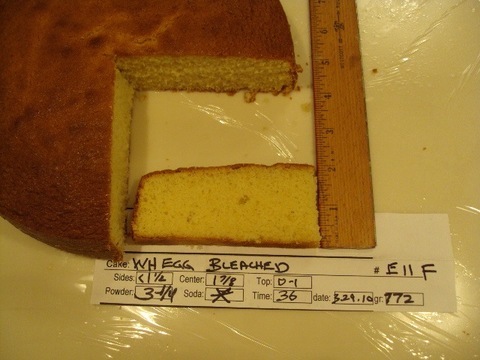 Egg whites will need more leavening than yolks (exact amount depending on the cake). 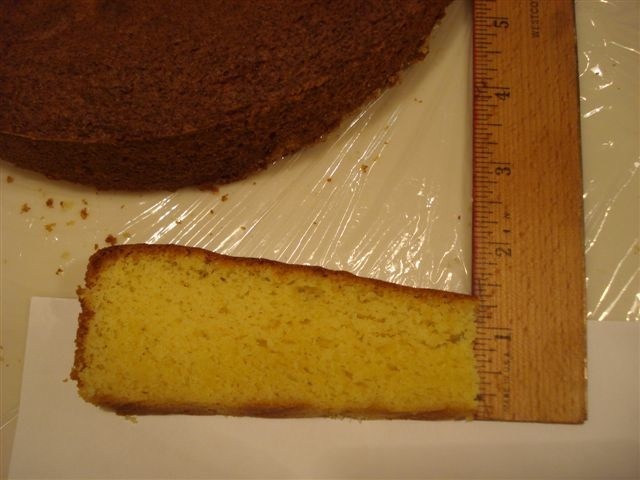 Whole eggs will need more leavening than whites (exact amount depending on the cake) Cake flour and bleached all-purpose flour result in the best flavor and texture in cake. If using unbleached all-purpose flour, the best flavor comes from replacing 15% of the flour with potato starch. The most level cake comes from using egg yolks or whole eggs. 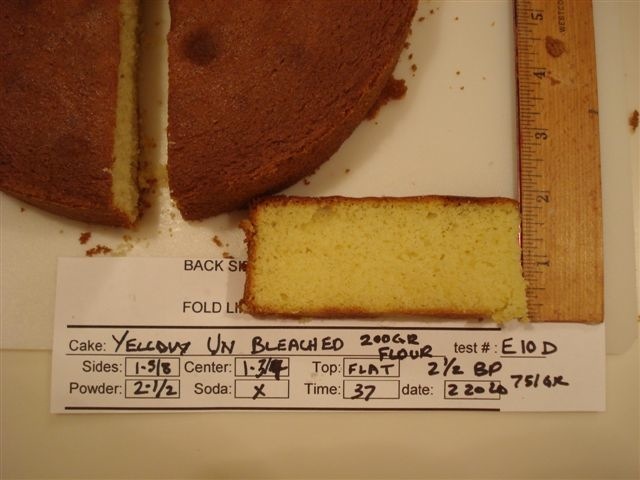 Woody conducted another test using bleached all-purpose flour and potato starch and I have added the results to the conclusion in the original posting plus the photo but here they both are just to be sure you don't miss it: bleached all-purpose flour and 15% potato starch to simulate cake flour results in a more even cake with smoother crust and better taste than cornstarch, but is not quite as tender. For years I have been saying how important it is to use bleached flour in cake baking and I still prefer it, but after making the fortuitous mistake of using unbleached flour in a cake baked in a tube pan, and discovering that the pan's center tube kept it from falling, I have revisited the subject and made some very interesting and ground breaking discoveries.Woody and I have conducted numerous tests using bleached cake flour, bleached all-purpose flour, and unbleached all-purpose flour in a solid (unmelted) butter layer cake using my one bowl mixing method and the All-Occasion Downy Yellow Cake from the Cake Bible. (We used two-thirds the recipe, first using two-thirds the baking powder (2-5/8 teaspoons). 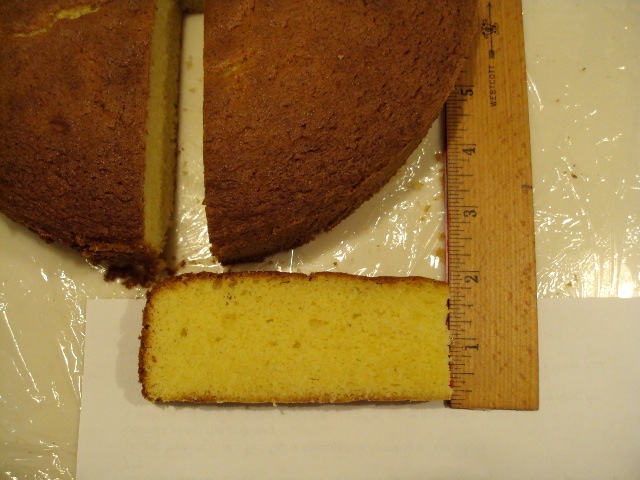 Then we decreased the baking powder to 2-1/2 teaspoons because we were using a 2" high pan instead of the 1-1/2" high pans in the Cake Bible (and higher pans need proportionately less baking powder). We found that when using bleached or unbleached all-purpose flour instead of cake flour, we got more tenderness (and in the case of unbleached flour improved flavor) by replacing 15% of the flour with potato starch which comes closer to cake flour than cornstarch.The overall appearance, however, with the bleached all-purpose flour is slightly lower either in height or in the center. 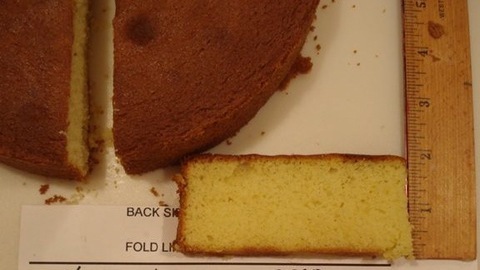 Our Conclusions 1. bleached cake flour is suitable for cakes where a very tender texture is desired. 2. bleached all-purpose flour and 15% potato starch to simulate cake flour results in a more even cake with smoother crust and better taste than cornstarch, but is not quite as tender. 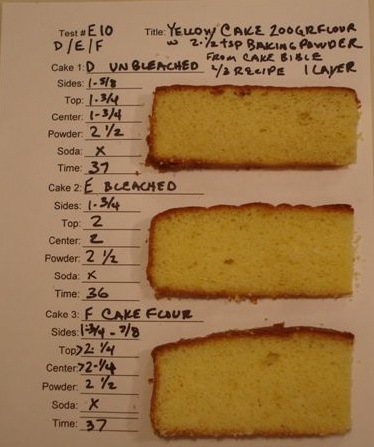 3. bleached all-purpose flour is preferable for cakes that benefit from more structure. 4. bleached flour results in the best flavor. 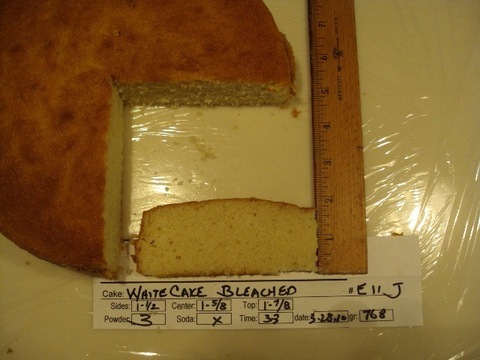 5. bleached flour results in the best volume. 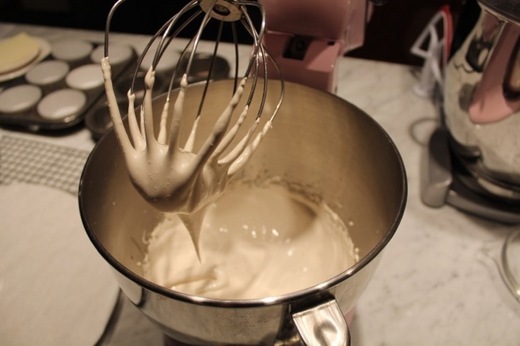 6. bleached flour results in the most tender and velvety texture. 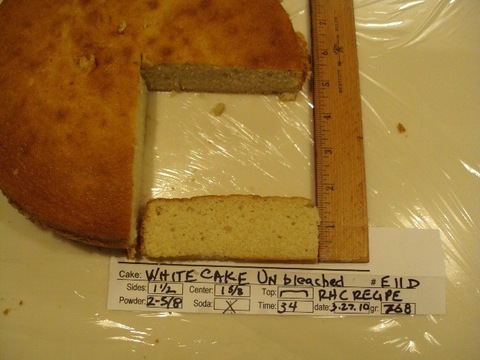 ..................................................................................................................... 7. unbleached flour results in less volume. 8. unbleached flour results in a coarser, chewier texture. 9. unbleached flour results in a cornbread-like flavor. ..................................................................................................................... 10. cornstarch substitution for part of the flour for bleached or unbleached all-purpose flour is less effective to improve structure than decreasing leavening, and alters the flavor. 11. potato starch substitution for part of the flour for bleached or unbleached all-purpose flour is even more effective than cornstarch as it softens the crumb. 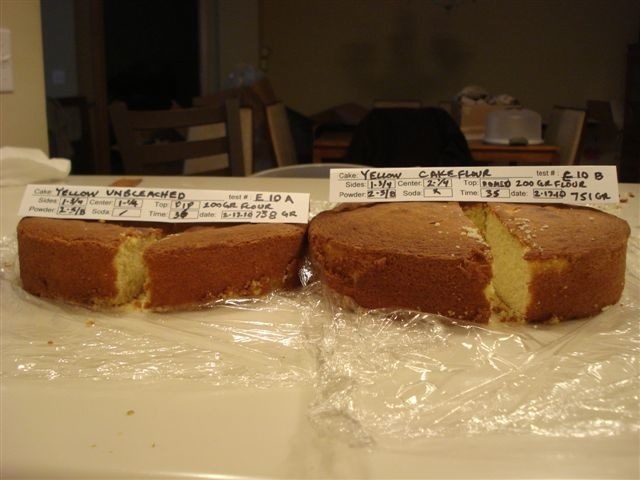 For the unbleached flour it also improves the flavor by lessening the cornbread-like quality. 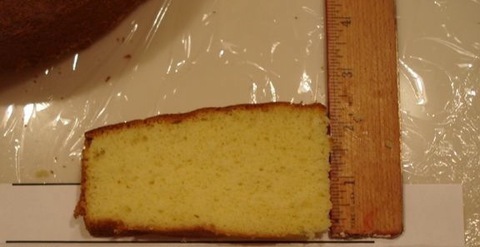 There are two desirable looks to the top of cake layers:1) slightly rounded for a one layer cake 2) perfectly flat to stack as a multiple layer cake Cakes dome in the middle for two reasons: 1) the metal on the outside of the pan conducts the heat faster so that the sides of the cake set while the center still continues to bake and rise higher than the sides. 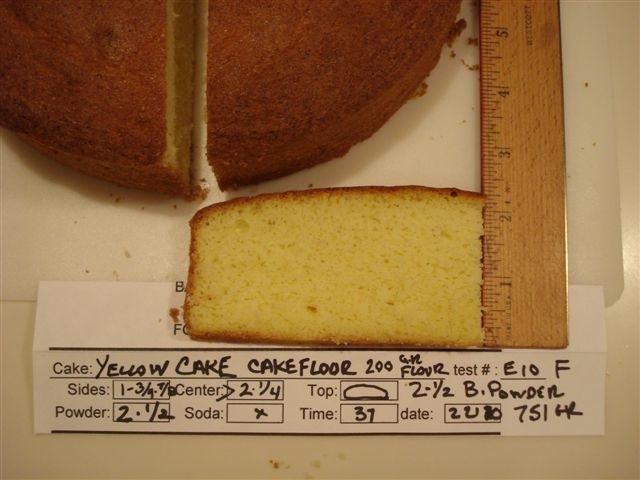 2) the structure of the cake is too strong, preventing the leavening gases from escaping til toward the end of baking when they erupt through the center like a volcano. My recipes are created to have the proper strength or structure of the batter to result in level or slightly rounded tops. Solutions: If you are getting doming: 1) try silicone pans (silicone does not conduct the heat the way metal does making the center to sides more even). 2) wrap metal pans with moistened cake strips. 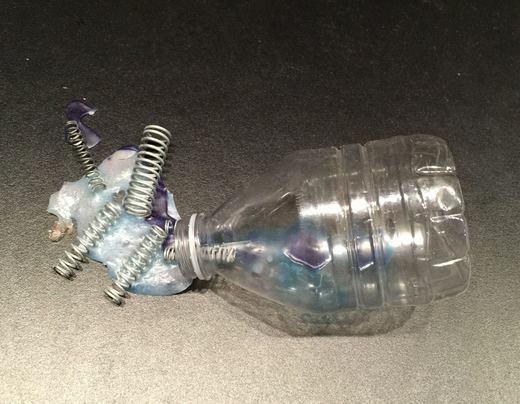 you can make your own by wetting paper towels and wrapping them in foil or purchase cake strips that can be reused many many times. 3) use a weaker flour. 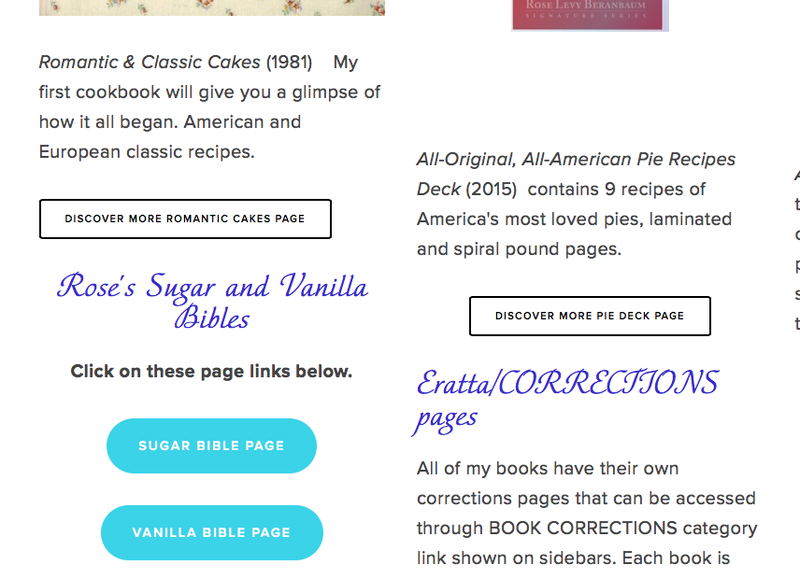 i you are using all purpose flour switch to cake flour. 4) increase the leavening. 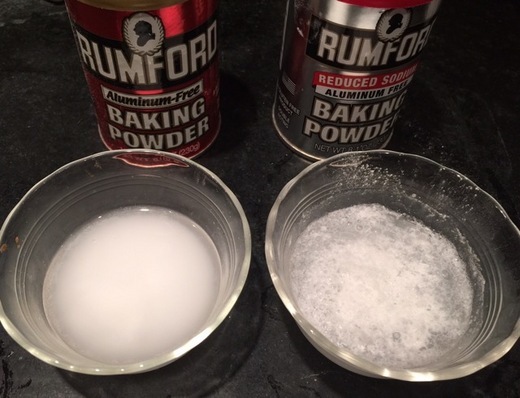 if using baking powder increase it by 1/4 teaspoon; if baking soda 1/16 teaspoon. you may need to increase it further depending on the results. leavening weakens the structure of the cake by breaking through the cell walls created by the gluten formed by the flour when combined with liquid. 5) increase the butter: an extra ounce of butter will coat the flour more preventing the formation of gluten, weakening the structure. 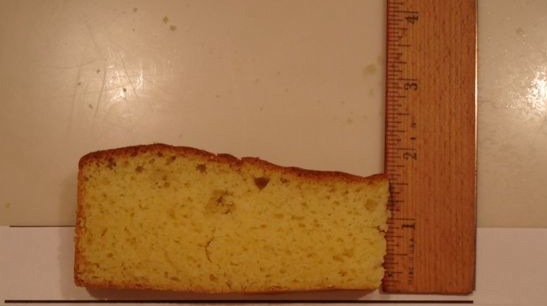 Cake mixes contain emulsifiers which give them what is known as tolerance, i.e., the ability to keep their texture despite additions of various extra ingredients. These emulsifiers result in an unpleasantly metallic after-taste. 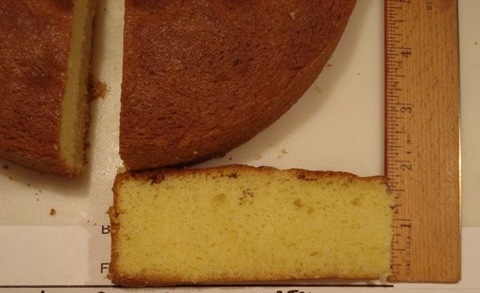 The flavor of a cake baked from scratch is incomparably superior.